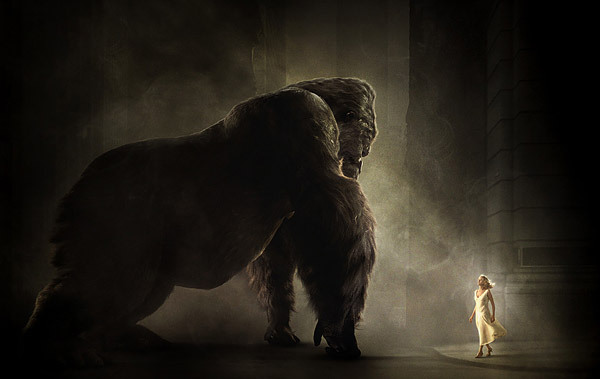 Peter Jackson's has long spoken of how important the 1933 King Kong was in driving him towards a career in film, and so his remake is a loving tribute, all the way through the last words of the credits, a dedication to the creative team behind the original, from Merian Cooper to Fay Wray to everyone in between. As I tried to stay warm while standing on the sidewalk yesterday, I wondered just how faithful Jackson would be the original. Can you really make the necessary improvements on someone else's work of art, especially when it had such an influence on you? King Kong, both the 1933 and 1976 version, are noteworthy in my moviegoing history as well. The 1976 version was the first movie I ever saw in a movie theater, in Salt Lake City. My parents couldn't afford a babysitter, so they took me with them. When those helicopters shot Kong off of the World Trade Center, I cried like a baby. Actually, I was a baby. I was two. I can't remember the exact year I saw the 1933 version, but it was magic. Like many boys, I loved dinosaurs and stop-motion animation, which seemed like childhood toys come to life in a way we could otherwise only conjure in our imaginations. King Kong was really the feature film birth of stop-motion animation, and even today it has a magical fake-real duality that computer-generated effects can't duplicate. The shots of King Kong groping for Jack Driscoll over the side of the cliff still gives me a jolt of joy. However, some things in the 1933 version couldn't be updated through merely improved special effects and a budget over 400 times larger than the original (which was shot for $500K, still a princely sum in those days). As much as I love the 1933 version, the story is hokey and the acting campy, and that's being generous ("Holy mackerel, what a show!" exclaims Denham upon seeing the natives performing a dance to Kong). Jackson wasn't working from source material on par with Tolkien's The Lord of the Rings. On the other hand, his adaption of that book couldn't have been any more successful. My concern wasn't with the movie's ability to recoup the investment or to earn massive box office over the holiday season. Of that I had little doubt. I had a different checklist of hopes in my mind under the lights of the marquee of the Times Square Loews. For example, could he infuse the thrilling adventure with some dramatic depth? Could he give Kong a real personality? When would I regain feeling in my feet? Jackson checked a lot of items off of that list, certainly enough to consider the movie a success as a rousing Christmas crowd-pleaser, and at the movie's center is a breathtaking action sequence. A few items remain problematic. Some seem fixable, and others might have to wait for the next remake of King Kong, which at this rate should arrive in 2041 or so. As we sat in the theater (for the world premiere, the movie played on 38 different screens in Times Square, split between the Loews and AMC on 42nd St.) waiting for the movie to begin, what sounded like James Newton Howard's score for the movie played over the sound system. It would have been a nice touch to have Overture displayed on the screen as in the 1933 version. "And lo, the beast looked upon the face of beauty. And it stayed its hand from killing. And from that day, it was as one dead." Kong also serves as foil to the ruthless film director Carl Denham, though the jabs at the entertainment business are more prickly than sharp. Kong also functions as Christ-like figure in some ways, worshipped by the Skull Island natives, crucified by Denham on a structure of wood and chains of "chrome steel," chains he snaps like Samson, but he's more a general martyr than a specific reference to any religious figure. It's not Shakespeare, but Jackson's version does a better job developing the theme than the original. A couple things help. First, the movie is three hours seven minutes long, almost twice as long as the original. Jackson spends much more time in the first third of the movie, in New York City, setting up the journey to Skull Island. Naomi Watts is a superior dramatic actor to Fay Wray, and the gap in acting ability between 2005 Kong and his predecessor is equally large. To be fair, the original Kong had the dopey face of a simple, tempestuous child of an incestuous relationship, while the updated Kong is aided in large part by the addition of an iris and a pupil in each eye. New Kong feels like a grownup male who still a good woman to teach him how to use silverware and to communicate his feelings. His eye-of-Sauron-sized orange-black eyeballs express more in a few frames than the black-on-white eyeballs of the original Kong did in an entire movie. The new Kong, like Gollum in The Lord of the Rings, was modeled in part on the actions of Andy Serkis, and as before, the process works. Kong is just as facially expressive as Gollum, and that 10 foot mug, combined with the realism of his gorilla-like movements, contribute to the most emotionally complex Kong yet. Naomi Watts has some evocative eyes of her own, and they're just one reason she's perfectly cast as Ann Darrow, the good-hearted, down-on-her-luck performer. When Watts opens her baby blues wide, few faces can match hers for vulnerability, disappointment, and sorrow. It's one reason she was so moving in roles like the ones in Mulholland Drive and Ellie Parker. That hint of emotional fragility renders her beauty approachable, and so if a giant gorilla was able to discern a vulnerable heart in a human female, Watts is as likely a choice as any. And, fans will be glad to hear, her screams are as piercing as those of the best of them. Both beauty and beast need every bit of that acting talent to convince the audience that a giant gorilla and a 5'5" woman could fall in love. In the 1933 film, Fay Wray never warmed to the original alpha male, issuing glass-cracking screams every time Kong laid a hand on her. The 1976 version added an almost cockamamie romance between Jessica Lange and the giant ape, but that dose of sugar was endearing and heightened the poignancy of his eventual demise. Jackson sides with the 1976 remake in the Darrow-Kong relationship. 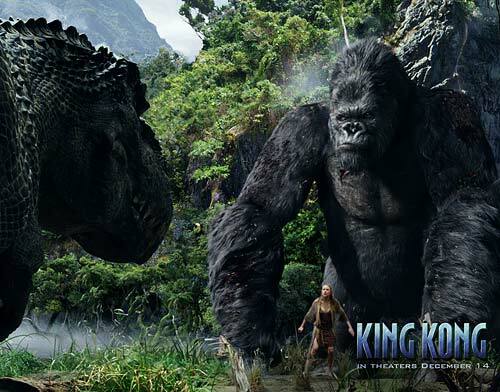 Darrow finds in Kong the only male that never lets her down, one both sensitive and fierce. They share two extended scenes of alone time, one on Skull Island, one in Manhattan, and both are magical and hokey all at once. I'm as prone as anyone to rolling my eyes at the first hint of mawkish sentimentality, and though I won't reveal what occurs in these two scenes, thankfully they're closer in spirit to Dian Fossey picking lice out of a gorilla's hair than Kong and Darrow sucking on the same spaghetti strand at an Italian restaurant, or Darrow and Kong running down the beach hand in hand, the late afternoon tide lapping at their feet. Celebrity marriages rarely last, but had the paprazzi and machine-gun-toting biplanes simply let this couple be, I would've given them even odds of a happy union, and that's about as loving a relationship as I can recall between a human and a digital character in the movies. At one point, I thought I spied another giant gorilla skeleton on Skull Island. Kong is the last of the giant gorillas, and his scars imply he's an older, lonely one, perhaps even a widower. Perhaps this movie can be added to a long list of autumn in new york romances, the older man with the younger woman, a simian companion to Lost in Translation. Jack Black has some memorable eyes himself, or perhaps it's his eyebrows? He was an interesting casting choice. I love Jack Black, but his eyebrows work against him here. As the unscrupulous director Carl Denham, Black wields that trademark arched eyebrow that italicizes everything he says and that bug-eyed intensity that wins you over with its hyperbole. His Denham feels more like a rascal than a fiend, and in part it's because you can't help liking Jack Black even when he's a raving lunatic, as in High Fidelity, for example. Jackson's remix adds some additional layers of plot. A trope comparing their journey to Skull Island to Marlow's journey up the Congo feels too loose and undeveloped. Jamie Bell plays a young shiphand who is reading a copy of Conrad's Heart of Darkness. During a key dramatic moment, he says to his mentor Hayes (Evan Parke): "This isn't an adventure story, is it?" (He's referring, of course, to the book in his hands and their expedition to Skull Island). Hayes replies, in a basso profundo with halting gravitas, "No, my friend, it isn't." I had to chuckle at that. Some other hokey elements from the 1933 movie remain, but fans of the original may find themselves more and more forgiving of those as the movie progresses as it becomes clear that Jackson is quoting many of them in tribute. Some scenes, camera shots, and character movements are almost exact duplicates of their 1933 inspirations: Darrow and Denham's meeting at the apple stand, the pan up the giant marquee in Manhattan announcing Kong as the eighth wonder of the world, the way Kong opens and shuts the T-Rex's limp and broken jaw like a handyman testing a broken hinge, or the way Kong fingers the bloody bullet holes in his chest after the first assault by the biplane squadron. Other remnants of the 1933 movie I could have done without. The savage natives of Skull Island return, though this time the ship's most noble crew member is black. Nevertheless, critics of the worldview of the 1933 movie will have some of the same issues to work with here. The natives of Skull Island revere Kong; the visitors from New York treat him as a marketable commodity. Only Darrow connects with Kong. The other carryover from 1933 that could have been excised is Charlie, the Chinese cook with the Fu Manchu, coolie outfit, and broken English accent circa Mickey Rooney in Breakfast at Tiffany's. He always made me cringe. He returns here in a bit part, as a random deckhand, Choy. Of course, what most people will want to see are the special effects, and this movie is filled with them, even more than The Lord of the Rings. With a budget of over $200 million, King Kong is at the bleeding edge of CGI and reveals the current capabilities and limitations of the technology. Some shots, most notably the brontosaurus stampede that's shown in the trailer, clearly look like green screen. The humans in the foreground are set off from the dinos in a way that resembles an old school matte. Some of it is due to the sharpness of the humans and the softness of the background dinos, but the lighting seems to be a larger issue. I'm not sure how that problem will be solved, but it's still a challenge that remains. I suspect that sequence is the most technically challenging in the movie because everything is in motion, the brontosaurus, the humans, the foliage, and the rock formations. In several long shots, characters or vehicles moving in the distance seem to stutter. I noticed it in one shot when an army jeep with a gun loaded on back turns a corner under the subway tracks, in pursuit of Kong. Also, in another shot, when one of the Skull Island natives pole vaults for the first time (you'll understand when you see it), the motion looks a bit odd. The hair on Kong is beautiful--CGI can handle individual hairs rippling in the wind. Rough skin textures, as on Kong or the dinosaurs, remain less than photo-realistic. Glossy or reflective surfaces, like the exoskeletons of insects, seem easier to render. One centipede (an insect that really grosses me out) gave me a case of the willies. Jackson's remake of the lost spider pit sequence is not crucial to the story, but it provides a chance to show off a massive and impressive special effects sequence. Supposedly the original was excised from the 1933 film after causing audience members to vomit, and even if that's an myth, it makes for a great story. Jackson and team recreate Manhattan, and the view of the city from the sky, from atop the Empire State Building, are beautiful, like a digital watercolor. All this technical detail is less relevant to the story's impact than something I'm curious about. Modern audiences, well-versed in CGI, are more discerning of its flaws, but at the same time are well-practiced in using their imagination to bridge the gap. This tangential discussion arises only from my own interest in CGI and its capabilities. Hopefully on the DVD or in interviews, Jackson will reveal his own thoughts. He was fairly candid in assessing what he liked and didn't like about the SFX in The Lord of the Rings trilogy in those DVD commentaries. The central action sequence, the one everyone will be discussing, is the famous confrontation between Kong and the T-Rex. To paraphrase Teri Hatcher in Seinfeld, it looks real, and it's spectacular (Jackson adds a twist, one I won't reveal here, but one that ratchets up the fun quotient over the original). It's one of those action sequences which just keeps elevating the insanity, long after you think it has reached a climax. When it finally concluded, the entire audience erupted in cheers and applause. Like many boys, I love dinosaurs, so I was in heaven. Instant classic. 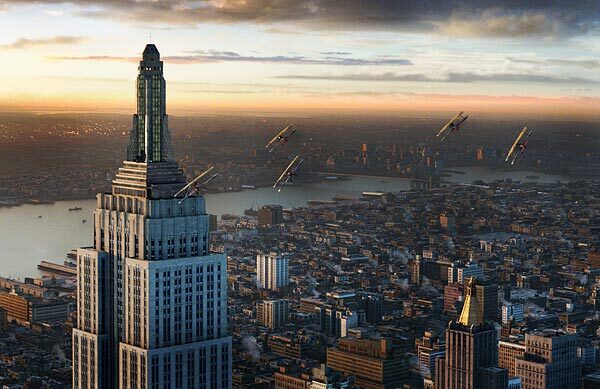 Another moment that took my breath away was the shot of Kong's fall from the Empire State Building. The camera shot is gorgeous, a combination pan-and-rotate camera move that induced just a hint of vertigo. The only way to pull off a camera shot like that would be to fly over a city with a movie camera mounted on an aircraft, shoot over a miniature, or create it digitally. The latter is proving to be the most cost-efficient and controllable choice for big-budget action movies. For action fans, one of the most enjoyable results of these advances is some of the complex shots directors can pull off now. The opening shot from Episode III, which plunges the viewer into the chaotic air battle, is one example. Some early unbroken shots in King Kong pan around the ship as it spins and bounces off of rocky outcroppings off the coast of Skull Island. Video games have long allowed for more three-dimensional reedom of perspective, but movies are catching up now that so many sets are digital. At the movie's end, as Jack Black's Denham approaches the body of the fallen Kong, I realized that he was going to utter the same closing line as in the original, and I found myself wishing he wouldn't. It doesn't feel right in tone. But given Jackson's adoration of the original, I also couldn't imagine him ending the movie any other way. This is hearty, holiday season comfort fare. Hollywood marketing has trained us to expect several categories on the cinematic holiday menu every year, as traditional as Thanksgiving turkey and hot cocoa. One of the entrees is always the mega budget action spectacle, escapist entertainment. It's the porterhouse of the holiday movie season. By virtue of Jackson's success with The Lord of the Rings, he's earned the freedom from studios to turn out three hour movies, and this movie already feels like a director's cut, with several scenes that feels like they would have been deleted scenes if the director lacked the stature of Jackson. I don't know about you, but at least once a holiday season, I like to let myself go and indulge in a meal with all the fat and trimmings and extra gravy. Now it's time for some salad. See the movie in a theater with a premium surround system setup. The movie has several scenes that make use of the surround and rear speakers. When Kong emerges from the forest for the first time, the camera locks on Darrow's face as she looks out in horror, and behind you, the sound of leaves rustling and tree branches snapping announce the entrance of the big guy, like the first bars of Enter Sandman or Hell's Bells when Mariano Rivera or Trevor Hoffman trot in out of the bullpen. The 360 degree sound mix in the biplane attack is good fun, too. James Newton Howard had only two and a half months to birth the score as a last minute replacement for Howard Shore. In its quieter moments, which aren't many, it's evocative, but it doesn't feel uniquely Howard. I can usually retain key melodic themes after leaving the theater (for example from Howard's fantastic score for Unbreakable), but not in this case. Three longer sample clips can be streamed here. The movie contains some intense moments. I'm not one to give parent advisories. My parents brought me to see the 1976 King Kong when I was 2 years old, and I saw Invasion of the Body Snatchers with my dad at a drive-in in 1979 or 1980, leaving me scared for several months. But if you bring your young children, be prepared to put a hand over their eyes during the spider pit sequence or when the Skull Island natives go wild. I thought I spied Godzilla in one of the Skull Island rock formations, a glimpse of a head poking out of the ocean.